Operation game inventor tries crowdfunding to pay for own operation. Inventor of Operation needs help with an operation of his own. 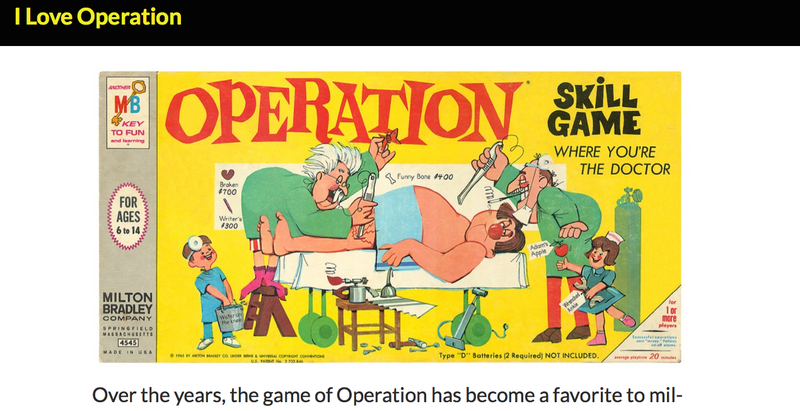 Fifty years ago John Spinello invented the hit game Operation, but now the 77-year-old needs help paying for a real life operation of his own. Despite the popularity of his invention, the $25,000 price tag for oral surgery is out of reach for Spinello, who sold the rights to Operation before it was first released for $500. To help cover the medical costs, friends of Spinello turned to crowdfunding for help. Spinello invented Operation while he was an industrial design student at the University of Illinois. The Bloomington resident was tasked to come up with an electric game where the object was to insert a metal wand into holes without touching the metal edges of the openings. “I got an A,” Spinello said. A family friend was so impressed that he helped Spinello get a meeting with Marvin Glass, a leading toy designer who gave the world novelty products like fake vomit and wind-up chattering teeth. He was also the force behind such classics as Mouse Trap and Lite Brite. “I walked into his office and I put it on his desk. I said, ‘You have to take this probe and go through the maze and see if you can complete it,’” Spinello explains in a video about the campaign. One of the friends who started the Crowdrise page, Tim Walsh, says the gamemaker Hasbro, who owns the rights to Operation, has supported the cause by allowing them to use the game’s logo and image for fundraising. Spinello is also trying to raise money by selling autographed copies of the game and plans to auction off the original prototype of Operation. As of Wednesday night, the Crowdrise page had raised just over $21,000.